In its last year of production, we have to give credit to the Polaris Outlaw 525 IRS. From our first ride across the Arizona desert years ago, we knew that the 525 was something special. It was easy to conquer rough, uneven terrain with the independent rear suspension on the 525 IRS, and the KTM engine was a torque monster waiting to be unleashed. Crack the throttle and you can easily raise the front wheels and your heart rate. Last year we named its straight axle stable mate (the 525 S) as Best in Class, only because the straight axle version weighs significantly less, but for 2011 that model disappeared. We also liked the ergonomics of either machine. Bodywork was minimal and the transition from seat to fuel tank was very smooth, making it easy to move around on when riding aggressively. Although the ride height is a tad taller due to a lower center of gravity from the powerful yet compact, liquid cooled, 510cc 4 stroke engine, the 525 IRS doesn’t have the tippy, top heavy feeling in the corners some other big bores do. It feels very sport quad like! In addition, all the controls are high quality parts; although we replaced the enormous stock throttle with one from another brand. 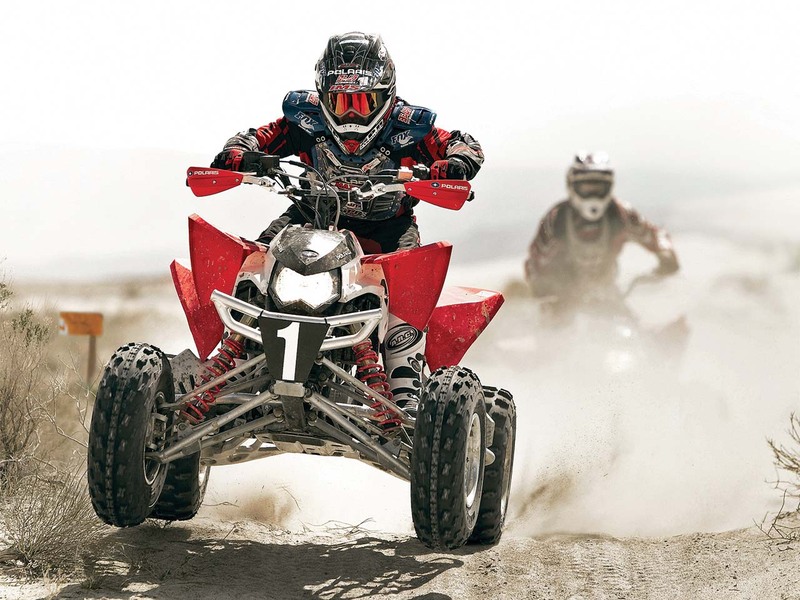 We really only had a couple complaints about the Polaris Outlaw lineup. They came jetted extremely lean from the factory to meet emissions, and adapting the KTM engines to their existing chassis created what is almost certainly the worst travesty of an air box in powersports history. Once you got it dialed in, though, on the trail or the track, the 525 IRS offered awesome performance, especially in the hands of an experienced rider. If you’ve got rough, rocky, or rutted terrain to conquer and you love to go fast, you’ll love the Polaris Outlaw 525 IRS. Its overall performance can’t be beat!